Features a private solarium and beatiful pool. Free self-parking and Security. Location: Right on the entrance of Playacar Phase II, on a Commercial Center you find this building, just a few blocks away from the sandy beaches. Playacar Phase I Beach Area- the best one in town. Features a private solarium and beatiful pool. Free self-parking and Security. 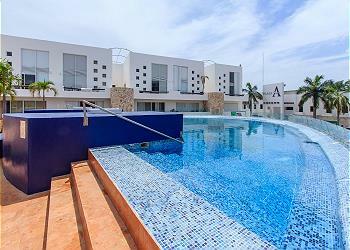 Location: Right on the entrance of Playacar Phase II, on a Commercial Center you find this building, just a few blocks away from the sandy beaches. Playacar Phase I Beach Area- the best one in town.